SIPIK 4 Way Hose Splitter, Hose Splitter for Garden 4 Way Water Tap Converter Connector Splitter Hose Pipe Adapter Garden Irrigation Watering(8.07 x 4.72 x 1.87). The arthritis friendly extra long handles make it super easy to turn the fully adjustable valves. Conventional 2 way adapters are difficult to adjust, particularly when the water is on and the valve is under pressure. The Gardenite connectors have a fully adjustable flow rate and shut off Strong grip for comfortable use. Double Your Hose Connection in Seconds. Solid construction for durable heavy duty use. Quick-connect faucet attachment designed for tight seal so no leaks. Easy-to-turn comfort handles that don't require pliers so anyone can open or close the valves without hurting their hands. *Easy to Assemble: You just only rotating the connector when hose splitter connects with your spigot. 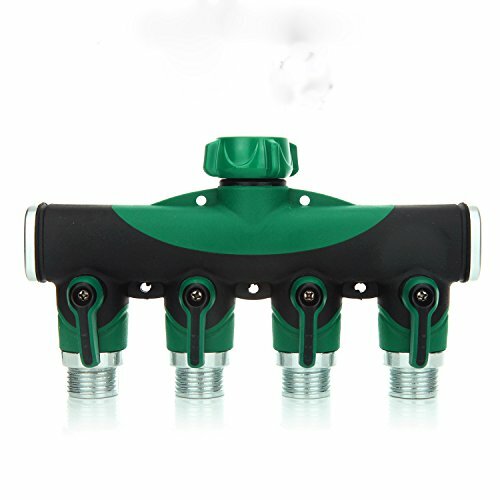 *Easily Converts 1 Spigot Into 4 : The hose splitter has 4 Way connectors, After using the water splitter, it easily converts 1 spigot into 4 high flow water sources. It can make your garden life easier. *4 Way Hose Splitter: Sturdy metal body and long handles for smooth and easy operation. *Bonus Washers: Rubber gaskets included to ensure a tight fit and prevent leakage. If you have any questions about this product by SIPIK, contact us by completing and submitting the form below. If you are looking for a specif part number, please include it with your message.